Paper Source is having a sale. Several items are being discontinued and the lines are being consolidated. So Meghan and I frequently discuss what is on sale and whether or not we are tempted to stock up. So far, I have resisted the urge to stock up. But today, I realized that I could buy these 5x5s for $2 each. That is a pretty great deal. In fact, they are cheaper than a pack of business cards. So I sort of lost it. I have a strange shopping dichotomy. I am very careful about everything that I buy and bring into my space. But on the other hand, I like to be thorough. So I am easily tempted to get one of every color available. I know that these two ideas work against one another. Since space has been such a big issue in my life, I usually resist. But today at $2 a pop, I gave in. Once I tallied up the cost in my head, I called Meghan downstairs and told her what I was thinking about doing – buying one of every 5x5s on sale. She told me that I was crazy. I hung up and looked at the colors. 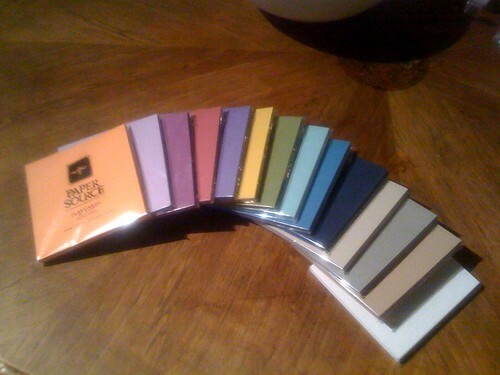 I had attempted to buy a spectrum of business cards during our Christmas employee discount days. But Henry was with me and told me that I had lost my mind. So I put quite a few colors back. But a couple of weeks ago, I was starting a project, pulled out my little business card drawer, and thought Hmmm…. I don’t really have that many different colors. I like to cut up the cover stock to create these little dioramas that I made for Allyson and Mary earlier this summer. I had an amazing collection of construction paper when I lived in North Carolina. It was made up of Peacock Papers. I had a huge accordion folder with all of the colors organized inside. I made countless little cuttings out of them beginning my freshman year with Shannon. By the time, we moved I had a huge yard sale of my supplies and loved treasures. I took a deep breath and put the paper in the pile. I sold my beloved collection for, you guessed it, $2!!! I think selling that folder of paper hurt me more than anything else I let go of that day. Ughh… I was crushed. So I got off the phone with Meghan and decided NOT to buy one of everything. I put back the Luxe and Stardream cards, just sticking with the matte color palette, which is similar to the beloved Peacock Papers. Although this particular purchase may seem excessive, it is still a great deal. Plus, the writing is on the wall. Since I don’t have a grandma in the vicinity, my days of relying on the Paper Source employee discount is limited. (And our discount is NOT 50% off.) So I caved. But I am excited about getting to work with these great colors and making some really sweet treasures. Please, please, please let me know what you would like to see. I prefer to make something for someone instead of just myself. If you really need to find a project for your new paper, may I suggest a swap? You could make a diorama for me and I can knit something for lil’ baby Armijo. What do you think? Every late spring baby needs hand knit sweaters. At least I think so. That is a fabulous idea!!! You are on.